Russia’s ubiquitous corruption is not a novelty that arose in 2000 at the dawn of the Vladimir Putin era, as some experts and politicians claim. Corruption was already a serious problem in the waning years of the Soviet Union, when personal enrichment became the main ideology for part of the political and economic elite. Post-Soviet Russia, lacking a well-grounded sense of social and moral values, still cannot grasp the importance of reputation and, partly because of this, bureaucrats have made personal enrichment their one and only goal. A contributing factor is that since the early 1990s, no real administrative reform has been carried out to meet the new challenges facing the country. For all intents and purposes, we have today a Soviet-style bureaucracy, only still more bloated, unscrupulous, greedy, criminalized and uncontrolled. Corruption in Russia began to inflate rapidly in the early 1990s, during the period of privatization. In established democracies, one of the main forces that keeps corruption at bay is political competition. In Russia, a tangible blow was dealt to political competition during the 1996 presidential elections, which led to an increase in the bureaucracy’s impact on all spheres of society and state administration. The parliamentary system began to grow weaker and the courts began to be less and less independent. When members of the security agencies were brought into the executive and legislative branches of power after 2000, the situation worsened. Meanwhile, a majority of the population had been duped into a false sense of stability with a wave of material goods. At this point, the interests of most of the bureaucracy and of society coincided on a number of points, such as a lack of interest in socially active independent media (which is another basis for fighting corruption) and in political competition. The bureaucracy’s strength, which was gradually increasing, contributed to society’s deterioration and as a result, we have a government in which corruption is essentially different from its Western counterpart in that it is fed by bureaucracy and the conditions it creates. For instance, new kinds of corrupt shadow corporations have emerged. They are practically uncontrolled because they are represented by the law enforcement, supervisory and judiciary bodies. 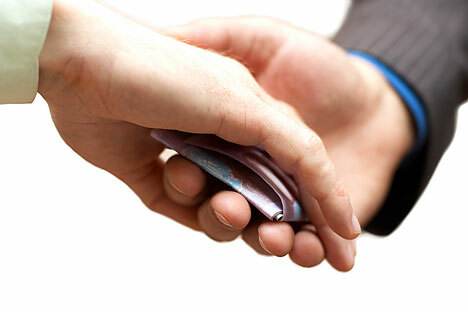 The corruption market in Russia is estimated at 210 billion euros a year; embezzlement of public funds stands at about 30 percent and kickbacks at 25 billion euros. In other words, corruption is the most lucrative and best-organized business in Russia. In 2008, President Dmitry Medvedev became practically the first leader to give an objective assessment of corruption in Russia. He spoke about the purchase of government posts, corruption in the judicial system, and the state and law-enforcement authorities being used as mercenaries to seize businesses. He publicly defined corruption as the main threat to Russia’s development and went on to submit legislation and a national strategy to suppress it. A number of practical measures have been taken to amend criminal law and administrative rules. Work has begun to reform the judiciary and law-enforcement bodies. In addition to legal measures, important as they are, the president underlined the need to restore and develop real political competition and transparency. He is using new methods and in some ways is independently establishing a dialogue with society. But why are all these initiatives stymied? Russians on the whole are generally content to be mere observers of the process. Fear and lack of confidence stemming from centuries of suppression prevail in people’s minds. Public debate has been eliminated, including in parliament. Any real action against corruption is seen as a challenge to the authorities. The corrupt elite are trying to mitigate as much as possible the harm anti-corruption initiatives can cause them. And yet change, including in the public consciousness, is possible, even within the next year or two. President Medvedev is no corruption-fighting version of Don Quixote; he is a man who is skillfully and carefully building up his anti-corruption strategy, preparing the legal tools that may in due course take on practical relevance. But for that to happen, several conditions need to be in place, the main one being the public’s trust and support. Kirill Kabanov is the head of the National Anti-Corruption Committee.